WhooNEW’s Zak Bruss and I attended the first Gallery Nite of the season on April 18th. We were very impressed with both the quality of the artwork we saw and the orchestration of the event. It reminded us of our time in New York, where we might stop at a local gallery on a Saturday night to meet the artist and have a glass of wine. Green Bay’s Gallery Nite, however, is unique in the fact that it has eleven participating galleries, giving you access to a smorgasbord of art, not just one gallery or artist. It’s really a celebration of our community, and was eye-opening to me. I knew we have great talent in Green Bay, but I never knew I would find so much art I want to hang on my walls! The way Gallery Nite works is easy – you park your car at one of the participating galleries. This year, the galleries are artessence, the ARTgarage, Photography by Emily, The Attic Books & Coffee, Cedar Street Gallery, The Glass Haus, The Main Salon, NL Johnson Art, NWTC Artisan Center, Photography by Fix, and Weathered Goods. 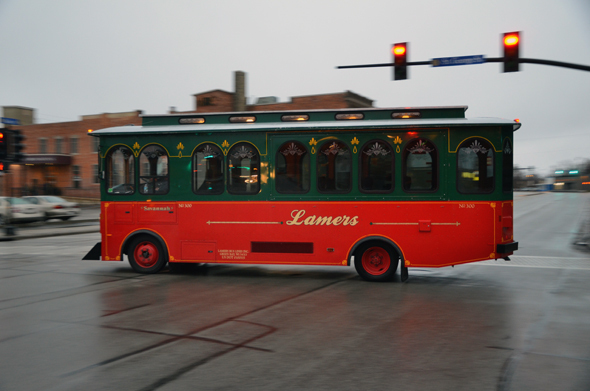 Once you’re at a gallery, you can hop on a LAMERS trolley to travel in style to your next destination. 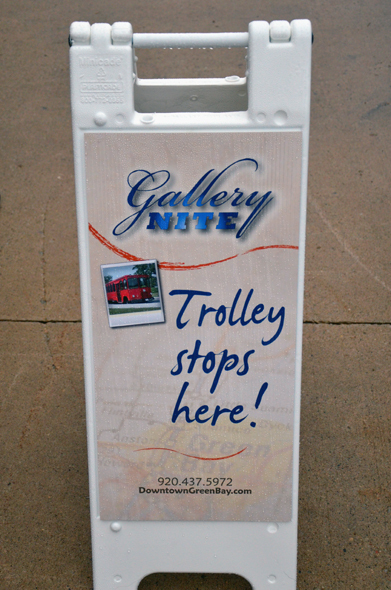 The trolleys stop at each gallery every fifteen minutes, so once you’re ready to move on to the next stop, you don’t have too long to wait. The event starts at 5 p.m., and the last trolley departs at 7:45 p.m, and will take you to whatever gallery you parked your car at. Don’t worry, you won’t get left behind! You might think that just under three hours is plenty of time for the event, but we found that we could have easily spent double the time and still not see everything. That’s why it’s great that Gallery Nite has multiple dates throughout the year. The next one is June 20th, followed by September 19th and November 21st. Also, for the 2013 season, Gallery Nite is featuring a few special additions. 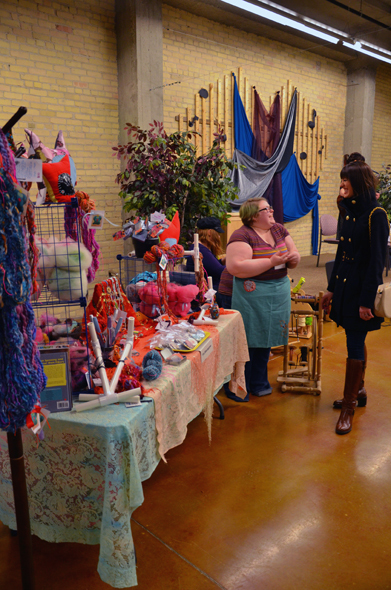 The ARTgarage is hosting an Artisan Market with local arts and crafts. We spent quite a bit of time there this time around. Bring cash! You can also find cooking demonstrations at the Attic, live music at the NWTC Artisan Center and the ARTgarage, student displays at East High School Institute for the Fine Arts, and tattoo sketches by Artrageous Ink at the Main Salon. We made it to a few of the participating galleries this time, and can’t wait to visit the rest. Here are the places and artists we discovered this time around. Our first stop was the ARTgararge, which is one of the neatest galleries in Green Bay. It’s located in the Olde Main Street District in a hundred-year-old cannery. 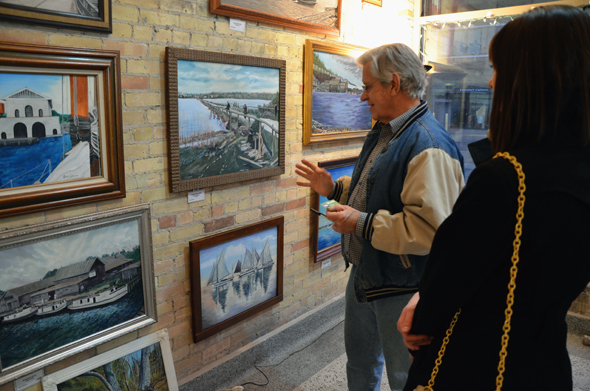 The exposed brick walls are a beautiful way to display the many different kinds of artwork at the gallery. 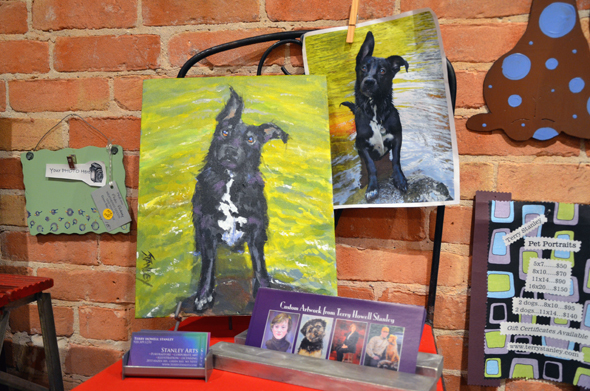 At ARTgarage, you’ll find art of every style, including sculpture and fiber arts. The building also acts as studio space for many of its artists. And, the ARTgarage offers classes on pretty much everything. Some are geared toward kids, and some toward adults. The offerings range from Chinese brush painting to bookbinding to toothbrush rugging. (Disclaimer: I have no idea what toothbrush rugging is, but it sounds awesome.) You can find a complete class listing here. 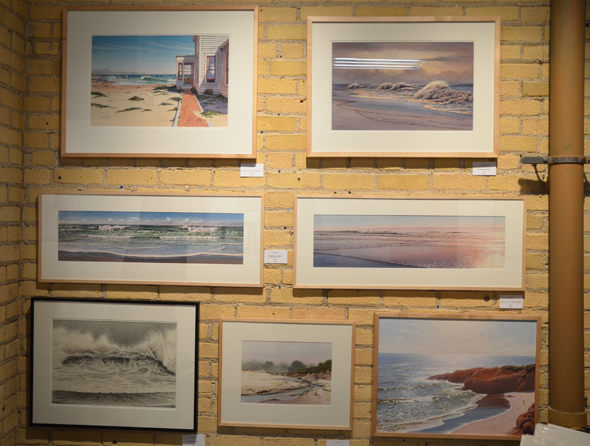 Lee Mothes’ landscapes grace the walls of the ARTgarage. Most of his work centers around ocean scenes, and is inspired by his childhood in California. He paints with acrylics and watercolors and also draws. But Mothes’ creativity extends beyond his paintbrush. He recently wrote a book, Keep Out! : Build Your Own Backyard Clubhouse. The book, which appeals to the Calvin and Hobbes-loving-kid in all of us, is available on Amazon. Mothes has also created his own imaginary world, New Island. You can find this land either in the southern Indian Ocean west of Australia or here. But be careful – you might just find yourself ready to buy a piece of land on the beautiful island – illustrated by Mothes himself, of course. 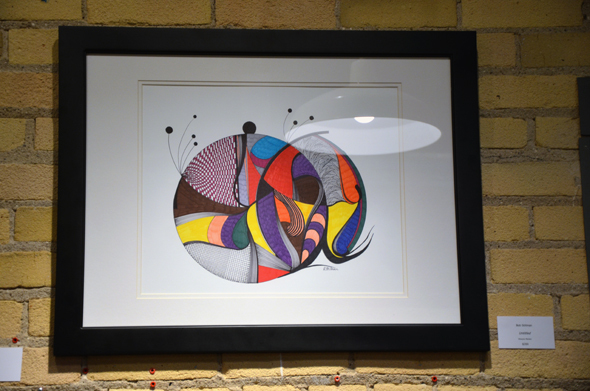 ARTgarage is also currently displaying the work of Sharpie artist Bob Stillman. Stillman’s work is exciting and unique. The pieces range from simple, black and white designs, to colorful, complex designs, and everything in between. Stillman said he often doesn’t know what he’s creating until he’s done. Other than the ARTgarage, you can find his work at Kaleidoscope Eatery & Spirits and the White Dog Black Cat Cafe. If you’re interested in his work, you can e-mail him at bstillman@new.rr.com. 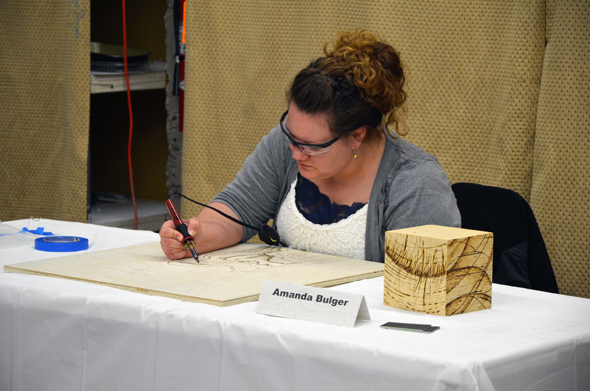 Amanda Bulger’s wood burnings are an excellent addition to the ARTgarage’s display. Bulger studied Studio Art at UW-Eau Claire. She told WhooNEW that she’s always been drawing, and that wood burning is a new step for her. Her work is both beautiful and extremely detailed; a single piece can take her up to sixty hours to complete. You can find a gallery of her work, which includes paintings and drawings as well as wood burnings, here. 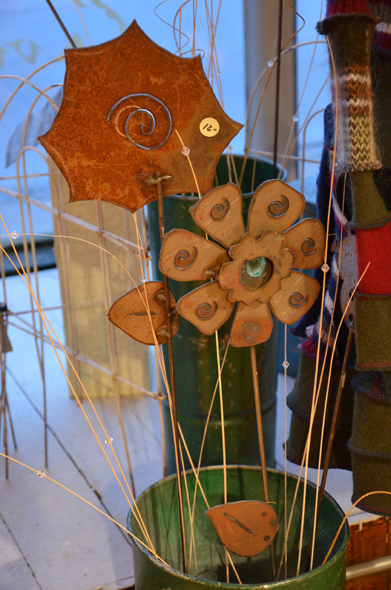 While exploring the artisan market at the ARTgarage, we discovered the whimsical work of ‘Trie Blasingame. ‘Trie is a mixed media artist whose work is often inspired by popular culture. At her booth, you might find jewelry, hand-spun yarn, or even a funky stuffed friend – all handmade, of course. You can find her work, as well as her very entertaining blog, here. 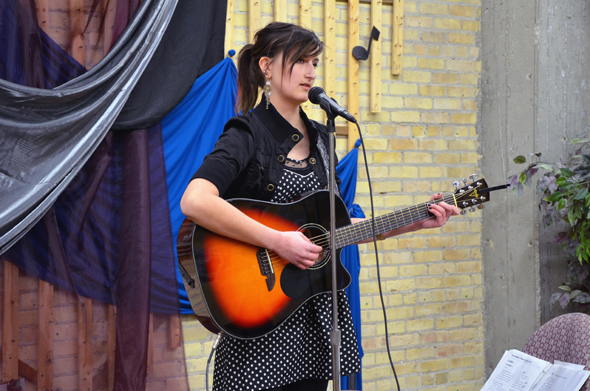 Local musician Liv Rather’s mellow music was a great backdrop for the artisan market at the ARTgarage. She is an acoustic singer/songwriter with jazz and indie influences. You can check out her music here. Zak and I spent almost an hour meeting artists at the ARTgarage, but we did finally hop on the trolley. The next place we got off was Weathered Goods, and we’re glad we did. This eclectic shop has some of the neatest vintage and handmade items I’ve ever seen. We could have bought a fireplace mantel, a vintage porch swing, and this birdhouse. This is potentially the most awesome birdhouse ever. 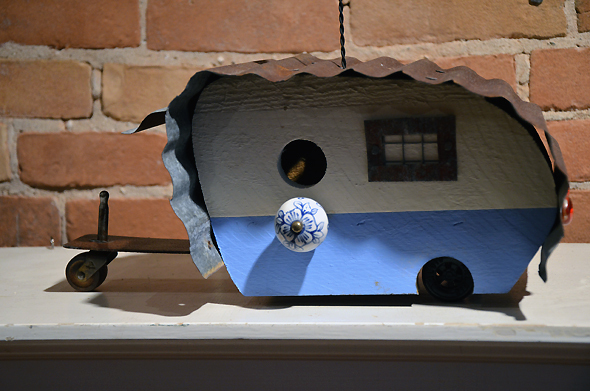 But Weathered Goods has more to offer than cool stuff; they also represent the work of 23 different artists. One of the artists we especially admired was Terry Howell Stanley of Stanley Arts. Stanley has done many different kinds of work, including portraiture, corporate art, and illustration. What we noticed first, though, is that he offers commissioned pet portraits at a very reasonable price. Our next stop was NL Johnson Art. You could easily miss this small gallery on Main Street, but if you love oil paintings, you would be sad you did. The gallery exclusively features the work of Norman Johnson. Johnson, who grew up in Door County, Wisconsin, primarily paints naval themes and landscapes. All of his paintings, whether capturing a historical moment or just a rural feel, tell a story. Johnson doesn’t have a website currently, but you can find his studio at 1263 Main St. Suite 127 Green Bay, WI 54302. 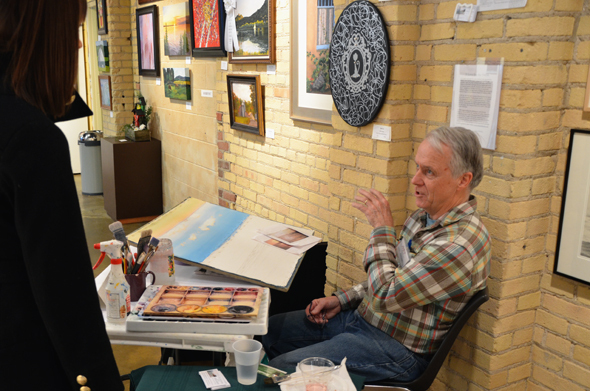 If you’d like to visit the gallery by appointment, you can call (920) 655-7722. The last studio we had a chance to visit was Photography by Emily. 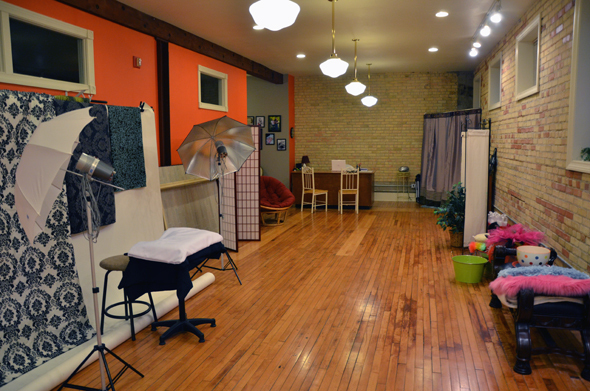 Emily Whicker, the photographer, has a well-designed space with great lighting to help you capture your memories. She particularly loves photographing babies and weddings, but also specializes in family and senior portraits. 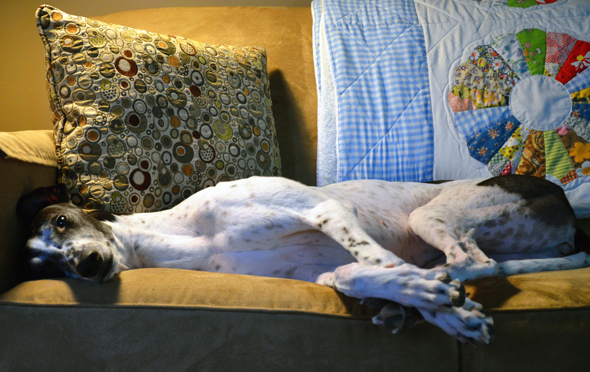 Whicker can work with you either in her studio or in the great outdoors. You can find examples of her work here. The next Gallery Nite is on June 20th. Hope to see you there! Also, if you attended the most recent Gallery Nite, we would love to hear your thoughts on the event. Who was favorite artist? What was your favorite gallery? Did you enjoy the trolley ride? Let us know in the comments below.